It's holiday shopping crunch time, folks. We get it: It's a busy time of year and procrastination may have gotten the best of you. But there's still plenty of time to shop the most stylish gifts of 2018, which we gladly found for you. The beauty of the holiday season is that it's the perfect time of year to give your loved ones exactly what you know they'll love and need (or at least want). 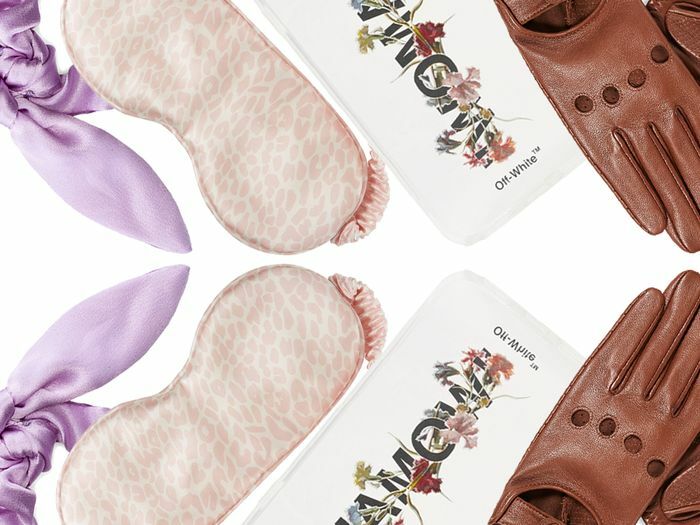 And instead of searching far and wide to find them that perfect gift when you have a million other things to do this month, you can just keep scrolling and shop the best gifts for both women and men for your budget. So without further ado, below, shop 32 stylish gifts to give, for under $50, $100, $250, and $500. Consider us your fashion elves. This is the perfect gift for someone who travels frequently (or just values their beauty rest). Jeweled buttons give this on-trend cardigan a vintage feel that pairs perfectly with high-waisted jeans. Give the gift of an adorable hat that will actually make the recipient wish for winter weather. A handbag or desk upgrade that's both chic and essential. Gifting underwear may be a bit of a cliché, but not when it comes to this classic set. A pretty hair accessory is a welcome addition to any stocking. This one is particularly fetching. Organization can actually be fun when it's in the form of this little pouch by a fashion girl–favorite brand. You truly can't go wrong with a fashion book that will look beautiful on a coffee table. This is one of our favorite 2018 releases. Even if he owns plenty of sweaters, there's always room for one more that's as classic and versatile as this. Even people who can afford $500 sunglasses wear Le Specs, so you know they're good. Everyone needs a cool iPhone case for their mirror selfies, and this one is at the top of our list right now. The color palette of this scarf is perfection. Trust us—they'll wear it year after year. We highly recommend this gift for anyone who does Pilates, yoga, Spin, or barre classes. This bra is somewhat of a mood booster, and it cleverly combines two of the year's hottest print trends. Want to give a designer gift without spending a ton? Consider a pair of these cool logo socks. Slippers are an excellent gift idea because people rarely remember to purchase them for themselves, yet they wear them almost every day. The bike shorts trend hasn't peaked yet, so there's no need to think twice about gifting this trendy item. Meghan Markle and countless other celebs and French girls approve of these sneakers, and so will your loved one. It's not every day we come across a belt that's as enticing (and compliment-worthy) as this one. Our collaboration with Tacori is filled with perfect gift ideas, but we especially love the personal touch that this bracelet provides. These pajamas are so good they'll probably want to put them on immediately on Christmas morning. There are tons of faux-fur coats on the market to choose from this season, but the price and uniqueness of this one are just right. Anyone with designer taste will certainly appreciate this classic Prada logo piece, and it won't cause significant damage to your credit card. Although lovely, the photo doesn't do this throw blanket justice—it must be touched. Crystal earrings are all the rage this season, and this colored-stone pair is especially covetable. This is the perfect It item for the fashion girl in your life—just ask the dozens of celebs and influencers who have been toting it. If this stylish, timeless sweater doesn't bring a smile to her face on Christmas morning, we're not sure what will. The Who What Wear team can't stop raving about these comfortable ankle boots. In fact, get a pair for yourself too. If you have someone on your gifting list who loves Kate Middleton (who recently wore an on-trend puffed headband), she'll appreciate this gorgeous gift. Every fashion person's favorite candle comes in a luxury version that burns for a whopping 150 hours. We've been enamored with this shimmering blazer from the moment we laid eyes on it. Can you blame us? These designer gloves would be a major upgrade to anyone's winter accessory collection.